I freaking love eggs! I love them for any time of the day and in just about anything....salads, sandwiches, ramen, deviled, and now I'm about to try my hand in pickling! Ps...Did you know that you can actually STEAM eggs?? I'm trying it out with this first batch of fresh eggs. 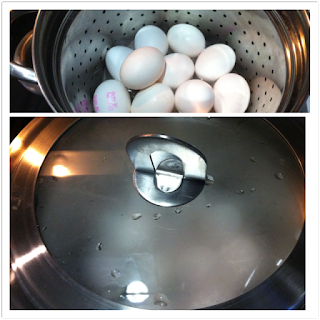 Apparently, if you steam fresh eggs as opposed to hard boiling them they will be easier to peel. Just set 1 dozen into a steaming pot and steam over boiling salt water for 20 mins! Boil mixture on medium heat for approx 15 minutes or until beets and onions are soft. 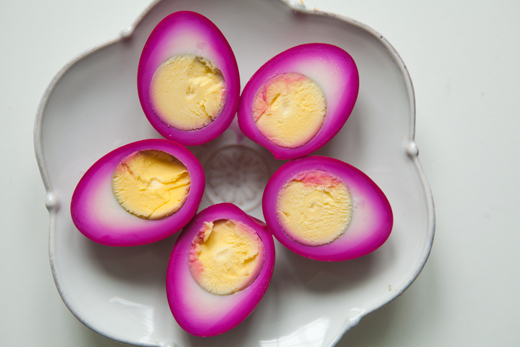 Let cool then pour over peeled hard boiled eggs in a jar till full. Be sure to add as many beets to the jar for more taste and vibrant color. In about 3 days they will be hot pink and ready to eat! Keeps well in the refrigerator for up to a month! Boil mixture till onions and jalapenos are soft. Let cool then pour over peeled hardboiled eggs in a jar till full. Ready to eat in 3 days, nice and spicy! Keeps for up to a month as well.